Mini-review: Blindness, by Jose Saramago. It was The Cay meets Lord of the Flies written for grown-ups by a great philosophical writer. I loved thinking about the book; I loved talking about the book. I just didn’t look forward to reading the book – Saramago’s characteristic lack of hard stops or quotation marks made me struggle a bit. Wasn’t bad in the theoretical, but really slowed down my reading – and not always in a good way. So let’s say 3 1/2 of 5 stars. My sister sent me a link to this, but I’d like to think I would have found it on my own eventually. 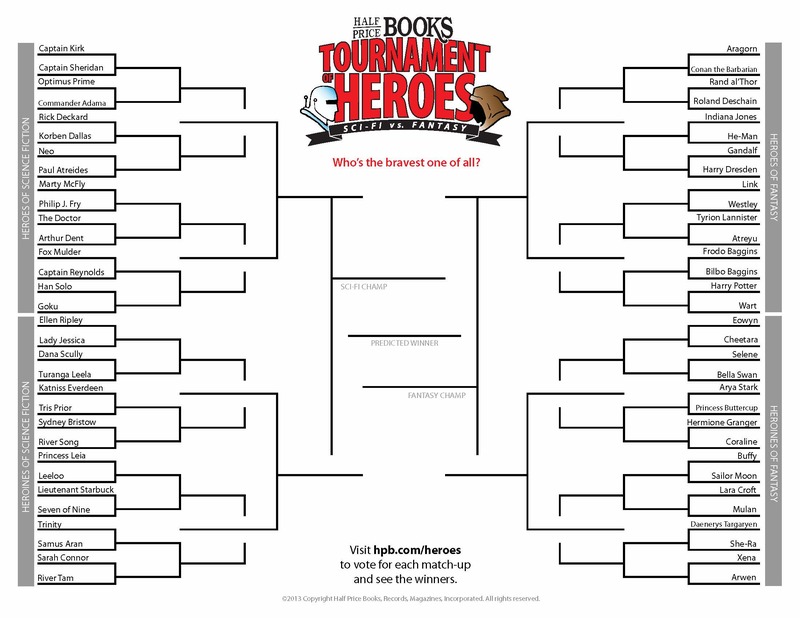 My favorite used book store (seriously – the staff all know me at my local), Half-Price Books, is sponsoring a Tournament of Heroes: Sci-Fi vs. Fantasy book bracket. Want to play along? Of course you do. First, here’s the bracket. Go download it and fill it out. Okay, so is everyone set? Ready to play? Okay, let’s do Science Fiction first. SCIENCE FICTION, ROUND 1. First battle: Captain Kirk vs. Captain Sheridan. Anyone who knows me knows I am not a Trekkie. Ergo, Captain Kirk dies, right? Um, except I have no idea who Captain Sheridan is. Hmm…Google tells me he’s from Babylon 5. He’s so much cuter than Kirk it’s not even funny. But since I knew who Kirk was without The Google, we’ll give him the win. Optimus Prime vs. Commander Adama. Commander who??? Gee, are you getting the feeling that Sci-Fi isn’t my thing? Oh hells no – Battlestar Gallactica? That was just an excuse for my geeky Ex to monopolize the TV with more Trekkie-type stuff. Optimus Prime all the way, baby. Rick Deckard vs. Korben Dallas. Deckard, Deckard…sounds maybe vaguely familiar? Oh, hey, Google says he’s in a book (points!) and, wow, kinda hott. Korben Dallas is…hmm…Bruce Willis is a Sci-Fi taxi driver in a movie that doesn’t look alluring even the tiniest bit. We’ll go with hott Mr. Deckard. Neo vs. Paul Atreides. Hey, isn’t Neo the guy from The Matrix? The Google says yes! And it says that the Atreides person is…someone from Dune? Uh-uh, no way. Dune loses because no way, not my thing. Marty McFly vs. Philip J. Fry. Marty McFly! McFly, McFly! I don’t even need to know who the other guy is. (But it turns out he’s the young cartoon dude from Futurama.) The Doctor vs. Arthur Dent. Even I know who The Doctor is. Arthur is…from Hitchhiker’s apparently. I’m going with The Doctor, if only so my sister won’t hit me. Fox Mulder vs. Captain Reynolds. Pfft. Let’s at least go through the exercise of looking up the captain person. He’s…from Firefly. Hey! Some people really liked that show! Isn’t that the space Western that was tragically canceled? I had weekly X-Files parties in college. There was no way anyone was beating him. At least not yet… Han Solo vs. Goku. Versus who? Goku is…apparently anime. Blech. But let’s be honest: Han Solo was going to win anyway. So that takes care of the Sci-Fi Boys of Round 1. Now let’s tackle the girls. (Or something.) Ellen Ripley vs. Lady Jessica. Sigh. I had to Google both of these ladies. Oh! Hey! Why didn’t they just say Sigourney Weaver?! [Sidenote: why aren’t ANY of the Ghostbusters on here?!] And Lady Jessica is…oh god. Another Dune-y. We’ll go with Sigourney. Dana Scully vs. DoesItReally Matter. I mean, Turanga Lella. Who happens to be the lovely cyclopian lady from Futurama, it turns out. Yeah, sorry, it’s Scully. Katniss Everdeen vs. Tris Pryor. And we have our first real competition! I thought Tris was maybe a little more badass. But Katniss seemed a little more complex and a bit more of the complete package. Also, I liked that Katniss was a bit reluctant to fall for anyone. (I call my bias the Anti-Bella Syndrome.) For that reason, Katniss edged out Tris. Sydney Bristow vs. River Song. Who the hell is River Song and what kind of stupid name is that? Oh. She’s from Dr. Who. I’m going to brace for my sister’s wrath and go for Sydney Bristow. [Sidenote: Hey, Kim – she’s played by JENNIFER GARNER.] Princess Leia vs. Leeloo. Okay, I have no idea who Leeloo is – Google says she’s a redhead from…that Bruce Willis movie? – but Leia could run half the known universe. In her sleep. Lieutenant Starbuck vs. Seven of Nine. Okay, guess what? I know both of these ladies! Not very well, but I could tell you a little about both. I decided to go with Starbuck because I like the idea of a woman stealing a role intended for a man, vs. a character that was hyper-sexualized in costume, even if Seven was supposed to be asexual. (I am thinking of the right character, right?) Trinity vs. Samus Aran. Who-what? Okay, Google says Trinity is that kickass chick from the Matrix. And Samus Aran is a…video game? comic book?…bounty hunter/heroine. She also looks rather badass. But once I put the name with the character, I knew who Trinity was. So she gets the nod. And finally, we have Sarah Connor vs. River Tam. (Who I typed out as River Tame. Probably a very different character.) River Tam, as it turns out, is a Firefly person. And the pic results from her Google Search make her character look very intriguing! Alas, Sarah Connor is a known badass. Familiarity wins.